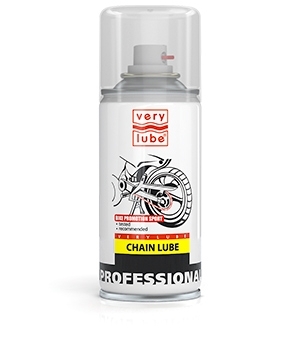 Applied in order to lubricate and protect chains of motor equipment and bicycles from wear. The grease is specially developed for high-speed and heavy-duty motorcycle chains. Possesses increased stickiness, remains on the chain even under the influence of high peripheral speeds. Has a considerable penetrating effect, reliably lubricates all the roller surfaces. Remove dirt and rests of the old grease from the chain. Shake the can. Spray the grease onto the inner side of the chain along its entire length and let it dry up for 5–10 minutes. Apply the grease every 300–500 km of run and each time after getting moisture onto the chain.